Have you ever played basketball all alone, how about baseball, soccer or hockey? Not so much fun, is it? Gets kind of old real quick, doesn’t it? The old adage, “there is no I in team” is so true. If I am playing against a team, and I am doing it alone, it is unlikely I will be able to make a basket, score a run, or make a goal. Teamwork is the fundamental backbone to any successful project. Working as a team gives everyone the opportunity to be part of the action, doing some good, having some fun. 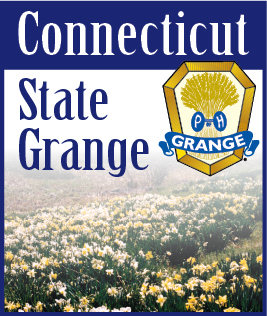 I did not get the Grange to where it is, neither did you, it took all of us, and for the Granges in Connecticut to grow, it will take all of us. We have set a very aggressive goal for Connecticut membership; we currently have just over 3,200 members, within four years I expect to see that number grow to over 6,400. It is not that hard, it will be a lot of work though, and we have the training, tools and people to do it. We have 58 Granges. If each grange gains 12 new members each year, that’s only one a month, we will add 2,784. Now we are getting close. Think about it, one member a month. Can you think of one person to ask to join the Grange, one, that’s all. So, ask them. Next time you see them, walk up to them, and start to chat about what went on at Grange that you enjoyed or bettered your community and ASK THEM TO JOIN! Do you think that is hard? No I don’t either, so what are we waiting for? Oh…, there is one problem with bringing in new members, they just might want to do something, and they might have a new idea. Are you ready for that? You need to be, remember when you were the new member? Remember when you had a new idea and how excited you were to share it? Remember how proud you were when you idea was accepted, implemented and successful? Remember that feeling when you cheer on and assist in other members ideas. If you operate as a team, as a team you celebrate your successes, but if you act alone, who shares your joy? Ok, so each Community Grange brings in one new member a month increasing our ranks by 2,784, that’s great, but we are not done, recall our goal of 3,200? Well, this is what we are going to do. The Grange Growth Teams will be organizing and reorganizing Granges in communities where we have had Granges in the recent past. We have lost over 40 Granges in the last 12 years, not so pretty if we leave it at that. I see 40 communities that are familiar with our organization and are just right to introduce its citizens to the Grange. It can be done. I believe it, I know it. I believe in the spirit of this organization and the strong will of our members. Jodi Ann, J. Allen, Jaimie and I wish each and every one of you the happiest and healthiest Holiday Season, may this season fill your hearts with love and kindness. Please remember your neighbors and those who are struggling for your gift of friendship and kindness can make the world of difference.